The perfect amount of seasoning to be happy! 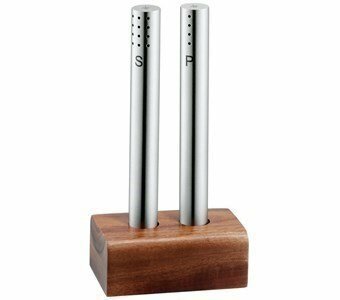 A combination between a charming rustic wood support and an attractive set of salt and pepper shakers in stainless steel. A simple model, very stylish and full of personality! A set that combines both with classic environments as modern environments. Brushed stainless steel with Cromargan Protection Protect ® and wooden support.